When we first got to our guesthouse in Bahundanda, we immediately noticed the beds. Comfortable mattresses are a rarity in Nepal and one of our goals upon entering any town where we planned to spend the night was to find the guesthouse with the softest beds. In many villages, the thickest mattress you could find was about as wide as a finger and Bahundanda turned out to be one of those places. Our wooden beds were covered in about a centimeter of foam padding, so we quickly asked the proprietor for any extra mattresses. We each doubled up on the padding, bringing our beds’ softness up to the level of your average paved road. One of my friends was having problems with his back, so he decided to take some mattresses out of one of the other rooms. In the end, his bed ended up a good 20 cm taller than mine and he kind of disappeared into the middle of a big pile of foam when he lay down. He seemed comfortable, though. Not so comfortable were the people in the now mattress-free room. We felt a little bad at first, but those feelings went away quickly when they actually showed up. They were part of a large group of middle-aged Dutch people who arrived an hour or two later, when we were in the middle of some rousing, high-tension card games. Every last one of them was incredibly loud and annoying. Not surprisingly, their loudness only increased when they noticed their missing bedding. I’m guessing this somehow makes us bad people, but I have to admit, we were pretty happy about their discomfort. Not long after going to bed, it started to rain again. Hard. So hard, in fact, that I decided to leave my warm comfortable bed piece of plywood and head outside to check it out. It was raining about as hard as rain can get and the deck where we had eaten our forgettable meal was already flooded. I decided it would be a good idea to watch the rainstorm from under the umbrella of a table on the edge of the deck some twenty meters away. My clothes were completely soaked through before I got even halfway there. It was worth it though. Listening to the torrents of rain hit the pavement from my little dry circle surrounded by walls of falling water through which I could barely see the dim lights of the guesthouse in the distance was one of my favorite memories from the early parts of the trek….and it lasted about a minute. That’s when the Dutch group’s Nepalese trekking guide decided to dart through the rain to keep me company and fill my little dry circle with cigarette smoke. And incredibly boring and mostly unintelligible conversation. This seems as good a time as any to detour into a little rant about trekking guides on the Annapurna circuit. I knew I would write this at some point in this series and there’s a good chance I’ll make room for another rant in a future part. Basically, guides, while useful and even necessary on many treks in Nepal, are not really needed at all on the Annapurna Circuit. More than unnecessary, I found all the guides we met along the way slightly annoying at best and downright obnoxious, creepy or offensive at worst. The main function of a trekking guide is to show you the way, but getting lost on the Annapurna circuit is pretty much impossible, as you follow two river valleys and are rarely ever alone on the trail, with hundreds of other trekkers, plus local traffic and near-constant donkey trains available to help you out, should you ever lose your bearings. Another reason many people opt for a guide is local knowledge. In theory, guides can provide you with a wealth of information about the areas you pass through and they can help you find better guesthouses for less money. Some guides are indeed quite knowledgeable, but most are just kids for whom this was by far the best job they could get. They know less about the area than you could learn from Wikipedia and they don’t care to tell you anything they might know anyway. We didn’t have a guide at all, but we found we could get any information we wanted from the owners of the guesthouses and restaurants where we slept and ate. Most of them love talking to guests and teaching them about their home towns. It also gives you a good topic of conversation, which is not always easy to find. When it comes to finding guesthouses, guides do not help you at all—they will simply take you to the places that pay them a commission. This means you pay more and enjoy worse conditions. The worst thing about the guides, though, is the incessant talking. Most of the people I talked to who had hired a guide were really regretting that decision mainly for this one reason. One of the most appealing aspects of a trek like the Annapurna circuit is the stunning scenery and the feeling of awe and serenity as you take it all in: the fresh mountain air, the fields, the forests, the clear rivers and waterfalls and, of course, the towering snow-capped peaks. It’s hard to enjoy that when you’re enduring a constant babble of mostly incoherent English and have to answer the same inane questions over and over, all day every day for the 14 to 30 days you spend on the trail. Ok, rant over. Let’s get to some actual trekking. We made it further than ever the next day, although we probably still covered less distance than anyone else ever has while walking for a whole day. The first section had us losing every meter of altitude we gained on our hard climb the day before, as we descended back down into the valley for a river crossing. We always dreaded seeing those on our maps, as it meant descending down to the river and back up the other side. In some cases that wasn’t far; in others, like this particular section, it was quite an ordeal. That’s not to say the descent wasn’t pleasant. The morning sun warmed the skin and gave the yellow rice terraces a fresh glow after the heavy overnight rains. Once we got down to the river, the valley narrowed, blocking the sun and cooling the air considerably. Climbing back up the other side kept us warm though. 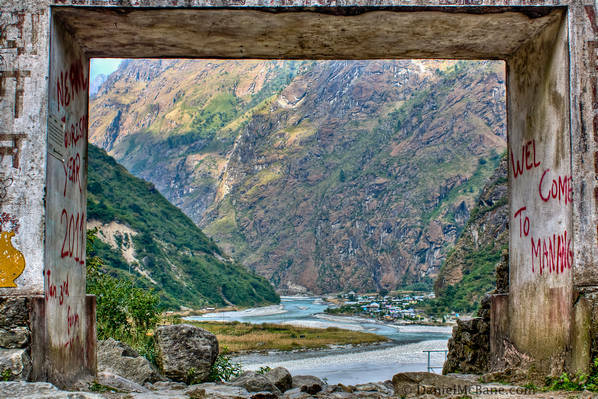 We started passing more and more donkey trains and goat herds until we ended the day in the town of Jagat, perched on a ledge far above the turquoise river below. This was the first town that felt cold and the first where we appreciated the solar-heated water. Or would have appreciated it, if the other guests hadn’t used most of it up and left us with cold showers. Great story. Annapurna circuit is perhaps one of the most popular of all circuits of Nepal. Nepal is a beautiful country but landscape is rough and not for the faint hearted and that is why you just have to get a guide. A fluent English speaking one is findable but can be difficult… I think mattresses in Nepal is a luxury, you will find foam or just some sheets to content with. In Nepal I found myself being happy with even an uncomfortable mattress, as some of the beds were downright painful to sleep in. 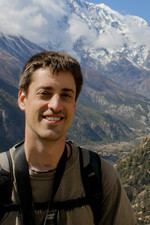 I agree that guides are necessary on many treks, but not on the Annapurna Circuit. For the most part, they did not seem to be worth the trouble on that route. I’ve enjoyed following your blog for a while now. This is a great post. I’m curious what do you do for a living? Do you have plans to “come home” someday, or are you basically a life long world traveler? I spent many years living in the South Pacific (PNG, Australia, and the Philippines) – but with a family now its difficult to travel as much (and more expensive too). Thank you. I usually stop in a place I like for a year or two and work as an English teacher to save money for my travels. I also supplement that by doing the occasional translation work. I don’t really have a home, as we moved all the time growing up (the longest I’ve ever spent in one place was during university). I’m not sure if I will ever “settle down” in one city, but I suppose anything is possible. I know what you mean about traveling with family; I just got some firsthand experience last week. My sister has a young child and we took a trip together to visit some relatives. It’s unbelievable how much more planning and energy everything takes when you have a child in tow. Interesting. What did your parents do, that allowed you to move around so frequently? You lead an interesting life. I run a small travel website now – hotelscheap dot org – I have a blog and I’d like to interview you through some prepared questions via email. We would write up a post about you, and talk about who you are, and what you do etc. its all above board, and it should be of some help to your website. Would you be interested in responding to our interview, and possibly sending an interesting picture or two? BTW – do you have a personal email? I contacted you on G+. Travel isn’t always pretty and I try to be realistic about that by focusing more on the difficulties and annoyances than a lot of other blogs do. That doesn’t mean I don’t love traveling, but I can see how some of my posts might give that impression. I adopt a snarky tone and I know not everyone enjoys that. I did the trek you did in 2000 with my brother. We hiked the Circuit to climb Pisang and Chulu West. No, the beds in the teahouses on the trail weren’t great, but they’re far better than sleeping on glaciers or ground and Nepal’s basically a third world country. So what would you expect to find on an ancient trade route that’s still just a foot path? If you didn’t like the guide you chose why did you hire the kid? Life’s all about choices you made yours then you bitched about it. All of our Nepalese help were great and tons of fun. Those kids are interested in practicing English and learning about the world from you and you put them down for it. Pretty elitist attitude. I was actually surprised by how nice many of the accommodation options along the trek were, but if I simply wrote, “There was a bed and we slept in it” my blog would be excruciatingly boring. I like to draw attention to the little problems and inconveniences we all experience during travel for entertainment’s sake, not because they really bother me. Some people appreciate this kind of humor and others don’t. As for the guide, I clearly mentioned that I did NOT hire one and chose to do the trek on my own. A big reason for that was my preference not to spend 8 hours a day for several weeks teaching English to someone I am paying to provide me a service. I often teach English to fund my travels and do not wish to do more of it during my free time, especially not while I am trying to enjoy the peace, quiet and relative solitude that a trek though the mountains can provide. There are basically two kinds of people: those who want to talk constantly while walking and those who prefer to be alone with their thoughts. I am obviously the second and from your comment I have to assume you are the first. Calling me ‘elitist’ for being different from you shows you don’t actually know the meaning of that word, but if we went ahead and accepted your definition of ‘elitists’ that would, ironically, make you elitist yourself. It looks like you’re going to be my travel muse for Nepal too! I find your guides so helpful. I had no intention of taking a guide but did want to hire a porter. Did you do that? Sorry if you’ve mentioned it in one of your other posts and I just missed it. Also, judging from your post dates I’m guessing you went in the summer months? I hope April isn’t a terrible time to try this. No, I didn’t hire a porter, but there were definitely a few times along the way, mainly during the first few days, where I was wishing I had. After that I got used to my backpack. That said, I took almost nothing with me and was really just lugging around my camera and tripod plus some clothes. If you’ve got more than 5 kg in your backpack, you’ll probably enjoy the trek much more with a porter. I started the trek at the end of October. The post dates are all over the place, because I didn’t have a blog at the time, so I didn’t write about the trek until almost a year later. And even then, I’ve only been adding a piece every month or two (or three) and am still nowhere near done with the series. Late March to early May is the second best season for the trek. The chances of clear skies are good, but not as good as late autumn. The rainy season generally starts around the end of May and brings cloudy skies and leeches. Thanks for tip about hiring guides. You reports are funny and it is weird some visitors cannot get it, and they leave a stupid comment. Keep writing! Thanks! It really comes down to personal preference in the end. I met plenty of people who were perfectly happy with their guides. Of course, most of those people were part of a larger group. That ensures that everyone only has to talk to the guide occasionally. If you’re on your own or in a very small group, you end up having to talk to them constantly. I am going to AC next week with my gf. She is totally concern about guide or getting lost!! !I assure her you don’t need a guide. Do you think it would be totally fine? And about TIMS , do you think i can get that from Besisahar ? Because i will straight go to Besisahar from Kathmandu, and i don’t have enough time to obtain the permission. Yes, you’ll be fine without a guide. It’s basically impossible to get lost. You follow one river valley to the pass and another one back down from the pass. As long as you’re near the river, you’re going the right way. Plus, there are always other trekkers around, many of whom have guides. I’m not sure if you can get TIMS in Besisahar. Everybody I know of got it in Pokhara or Kathmandu. I’d find a way to do the same, unless you find out with 100% certainty you can get it in Besisahar. It doesn’t take long–you just go in and pay some money. If I remember right, you also need a couple of photos. That said, it’s Nepal. If you don’t have one, you can probably just pay off the guy who checks. I came across your blog by chance and cannot agree with you more. Great to hear another perspective on hiring a guide in Nepal other than the usual “Help-the-locals; Don’t-be-stingy” perspective. Well, I’d say, by all means, help hiring a local, but maybe not when he could completely ruin the experience. Allow me to reiterate your point by sharing my story. My husband and I definitely regret hiring a guide for our trek. It was another Nepal Himalayas trek, the Gosaikunda trek which most websites say it’s one of the routes that can be difficult to navigate given that there are a lot of different routes overlapping, so we decided to believe them and hire a guide. He was exactly as you mentioned, extremely obnoxious, pompous, and he sang all the way through the trek. I guess he kind of sensed what we were thinking when we came across so many independent trekkers along the way, because he just couldn’t help, but trying to rudely convince them (while we were around, of course) that it was foolish and dangerous to trek without a guide in Nepal. He repeated the same thing to every single one of independent trekkers we came across. How embarrassing. We kind of felt responsible for it. We chose to pay for food and accommodation directly to the guesthouses and upon hiring the guide, we made our conditions clear that we would get to choose the accommodation ourselves. Well, not so. He always played the same tricks. Trick 1) It will be full everywhere by the time we get there (None of the places we stayed were even half-full. In two occasions, there was only one other guest). Trick 2) He knows best where to stop and where to stay, so we should leave it to him. On the night before we had to cross the pass, he stayed up late at night singing and playing drums with the young inn-keepers in the room next to ours (so only thin plywood between us). We went to sleep much later than we should have, because no earplugs in the world could block the sound of drums and 6 young men singing so close to the ears. We still managed to get up on time, but the inn-keepers who were kept til late by our guide didn’t. In the end, we had to wait more than an hour for them to get up and prepare breakfast for us. An hour after we started for the day, most people already arrived from the other side of the pass and it already started to snow. The snow was up to our knees when we descended (There were no other trekkers around.). I grew up in a Thai port city, so, of course, it took me forever. The guide started to get agitated and insisted that I let him carry me on his back. Considering how many times he himself slipped and fell on the snow earlier, I feared for my life and declined. He got even more frustrated. We finally arrived at our lunch stop at 3 pm. It wasn’t our fault that we left 2 hours late! I told him that I was exhausted and completely shaken by the experience. There was no way I could go further and I’d like to stop for a night there. He was furious and insisted that I kept going. I refused. He mentioned that we will miss the bus back the next day and I said I don’t care, I’d hire a jeep. He said that it was impossible. I said why not? If he can’t find one, I’ll find one. I don’t care how much. I’d pay. I mean what’s the point of hiring a personal guide, if everything is going to be so inflexible. He finally gave up and turned to the inn-keepers to bad-mouth us in our face as if we wouldn’t notice. The inn-keepers and other guides all turned to us and gave us the strangest look. The next day, we arrived at our final stop as planned. The inn we stayed in arranged a jeep for us with no problems whatsoever. The guide demanded tips even before we finished our dinner that night and invited himself on the jeep with us the next day. He was the same age as us. He was young, but so were we and we don’t think it gives us excuses for anything. I decided that I’d never go back to Nepal unless I can trek without a guide. Thanks for your suggestion. I’ll try Annapurna circuit next time. P.S. I hired a local guide for our trek in Haba, Yunnan. I speak minimal Mandarin and he speaks absolutely no English, but we got by just fine. Had a wonderful time. Sorry about the long, tedious rant. Wow, I’m sorry you had such a bad experience. I met plenty of trekkers who were happy with their guides, but I also met enough who weren’t that I’m really glad I decided not to hire one. Your experience sounds like one of the worst, but it illustrates an important point: the wrong guide can really ruin what should be a wonderful experience. I’m glad you had better luck in Yunnan and hope you have a much better time on any future treks, be they with or without a guide. Can t believe I m reading two paragraphs about a freaking mattress! What did you expect? I did EBC, and all I remember was how beautiful it was. No, i didn’t sleep in the most comfortable bed, and I couldn’t shower for 6 days, but I couldn’t care less, it was nothing short of an epic journey. It s unreasonable to expect such level of comfort. Also, total lack of respect to request another mattress, but that’s me..
You are right about guide. Mine was below the expectations, quite unprofessional to put it midly, still the trip was one of the best I ve ever had, and I ve travelled quite a lot. That does make us sound a bit spoiled doesn’t it? The truth is, soft beds just make for better sleep, so we always tried to find them. But like you, we just dealt with it when we got hard beds. In this instance, too. We didn’t “request” more mattresses, we asked if he had any extras we could use. And he did, though they didn’t help much. And I also thought the trek was perhaps the most incredible month of my life. I loved it and hope to do it again someday. I really hope that comes through in these posts. Does EBC stand for Everest Base Camp? I thought about that trek, but people who’ve done both told me to do Annapurna if I only had time for one. I would like to do the Everest one next time. An it sounds like you really enjoyed it. Apart from the guide. Sorry you got a bad one.